Hightail DropBox formerly "You Send It"
NOTE: FundRaiser Spark does not include households. This setup is for those who do not want the Recurring Gifts or Email Changes. This setup will not restrict your remote access. NOTE: It is illegal to use the Advantage Local Server with an application server product to access the database on behalf of remote computers. If you intend to remotely access FundRaiser Select or Professional using an application server like Citrix or Terminal Services you must purchase the Client/Server option which provides the legal access necessary to service the remote computer. This setup is for those who are updating from a version earlier than 3.50. Install this update first as an intermediate update stage, then start the program once. Then you can install any newer version on top of that. The following Advantage utilities and upgrades are made available for the convenience of our users. No warranty is expressed or implied. Please consult with your technical support representative if you have any questions. You may also refer to the Advantage web site for more information. The following programs and utilities are made available for the convenience of our users. No warranty is expressed or implied. Please consult with your technical support representative if you have any questions. This program enables you to export all FundRaiser data to industry-standard CSV files. Test your Firewall Security We recommend that you check the security of your network firewall on a regular basis (monthly is good). Gibson Research Corporation (grc.com) provides a free service which will perform this check for you. GroupLink.dbf Wintix 3/4 table to fix duplicate checking dragon error. Files for IMB Postal Code features. 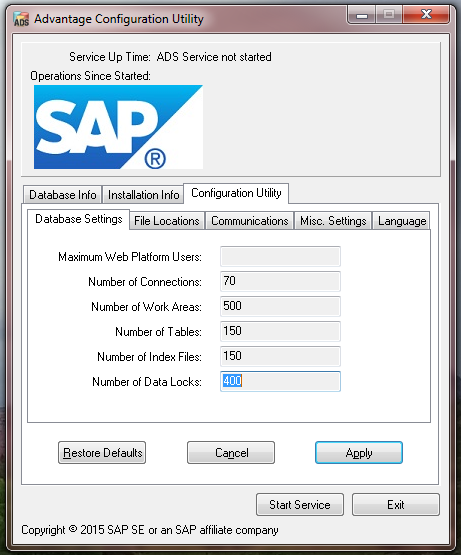 This program installs the Data Drivers for connection to Advantage Databases using the Windows ODBC controls. Please use with caution, Technical support is not responsible for data corruption when using the ODBC driver. Use this version of workstation setup when the regular one does not work. This version does not install any dll's or change the ADS.INI file. Use this version of workstation setup to workaround permissions issues. This will hopefully fix a WinSock problem caused by spyware or adware software (that was released by other companies). contains CSV2FR, which will import a csv file into a FundRaiser adt data table. The CSV file must contain fields with names that exactly match those in the associated FundRaiser table. You need not include all fields in the CSV file, but all that exist must be correctly spelled. This file contains a small utility that will display notes on each table and field. This zip file must be extracted into the main FundRaiser Program folder. Ask Tech Support for the password that is needed to unzip this file. Standalone [DDInfoTool-Full.zip (4,114kb)] version does not need FundRaiser to be installed. Not all tables are yet documented. The most important are, though. After restoring (or unzipping) this backup, you will then need to run the DDUpdate utility in the FundRaiser folder, which will bring the data structure up to your current version. The following version of our software is provided only for technical support issues.